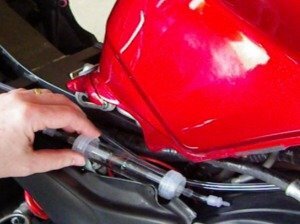 Enjoy easy chain oiler installation that preserves the clean lines of your bike. The outward signs are barely visible. There are no tubes zip tied to your swing arm. 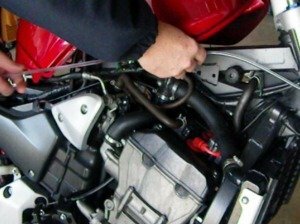 The inlet tube may be installed in a variety of places at the front of your bike. The inlet is installed at the front to catch clean air. 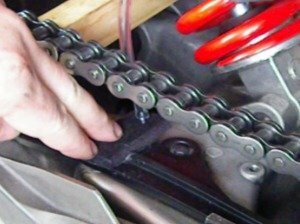 The chain applicator installs to the swing arm chain slider. The applicator puts oil directly the inside radius of your chain links. This eliminates misdirection of oil to other parts of your bike. The Motobriiz chain oiler operation is also very clean. The reservoir is normally installed under the seat. This provides a secure and protected location. A supplied absorbent mat which will catch any drips from refilling. The mat also provides padding for the reservoir. The inlet tubing is run from the front of the bike to the reservoir inlet. Just tuck the tubing under the tank and behind bodywork for a stealthy install. Connect the tubing to the reservoir outlet by simply pressing the tube onto the quick connect fitting. Route the other end of the tube to the applicator. Press onto the fitting. Applicator installs securely to the chain slider with the supplied adhesive. Let it cure and you are ready to roll! The water trap is installed anywhere along the inlet tube, cut out a section and press the tubes onto both ends of the quick connect fittings. It is a snap! The Motobriiz design ensures easy installation and operation. Remove the reservoir from the tubing. A quarter turn is all that is required. Fill with oil and reconnect and you are ready to auto lube. Simply twist the throttle and enjoy!